Nowadays, we expect software to be able to change the tempo of recorded audio, but the latest version of Pro Tools integrates this functionality in a new and impressive fashion. Often, the most exciting new features in Pro Tools appear first in the highend HD version, and there's a frustrating wait before LE and MPowered users get them — if they ever do. So it's a welcome change to find that nearly all the new features in Pro Tools 7.4, including the big one, are for the HD, LE and MPowered platforms. The biggest new feature in the 7.4 upgrade is something Digidesign call Elastic Audio. The idea behind Elastic Audio is that it allows you to work with audio in the Edit Window as if it was MIDI. All the things you take for granted with MIDI — moving and stretching notes and phrases, conforming loops to new tempos — can now be done with audio Regions. Elastic Audio uses a combination of transient detection, beat and tempo analysis, and timestretching and pitchshifting algorithms. These are not new technologies, but what is new is the way Digidesign have integrated Elastic Audio into the normal Pro Tools working environment to make using it as easy as possible. Major changes have been made 'under the hood' to ensure that Elastic Audio works as seamlessly as possible, but these are only apparent in a few places; one such is the System Usage window, which has a new CPU Usage indication for Elastic Audio. Elastic Audio introduces two new track modes, Analysis and Warp, and four analysis algorithms to choose from.Elastic Audio is accessed via a new track mode in the Edit Window, which offers one of four realtime algorithms that you select to best suit the type of audio content on that particular track. Three of these are timestretch algorithms designed to keep pitch constant whilst varying speed: they are Polyphonic for multiinstrument loops or complex instruments like pianos and strings, Rhythmic for drums and anything percussive, and Monophonic for singlepitch instruments including vocals. The fourth algorithm is Varispeed, which produces a tapemachinelike varispeed effect where pitch and speed are changed together. The System Usage window displays Elastic Audio activity separately from RTAS plugin overheads.You can choose whether Pro Tools will handle all the time compression and expansion in real time, which is quicker but puts more load on the computer; or render, which means you have to wait for the files to be processed each time you change something, but has the advantage of not increasing the load on the computer. The rendered option gives you the ability to use Digidesign's XForm algorithm instead of the four types listed above. When you change an audio track to Elastic Audio mode, Pro Tools automatically takes the audio offline for a while to analyse it for transient events. These might be drum hits, the beginning of a sung note or the start of a chord played by a guitar. These detected events then serve as control points for what Digidesign call 'warping' the audio. 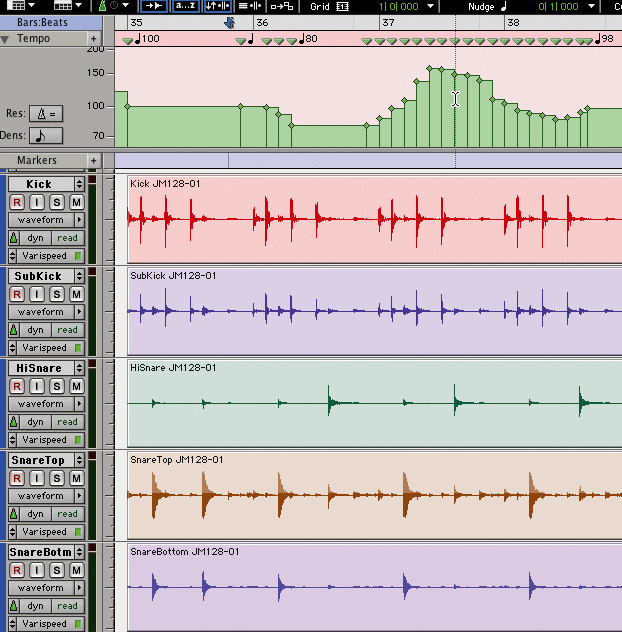 Pro Tools can warp audio events either automatically, such as when conforming audio to the Session tempo or quantising audio events to a grid, or manually, using the standard editing tools in the new Warp track View. Elastic Audio analysis automatically detects transients and places Analysis Markers, which can be moved manually.Once analysed, the file comes back online and you can then swap to Analysis View to see where Pro Tools has put Event Markers. You can correct Pro Tools' automatic transient detection by manually moving, editing or deleting Event Markers, in much the same way as you can in Beat Detective. 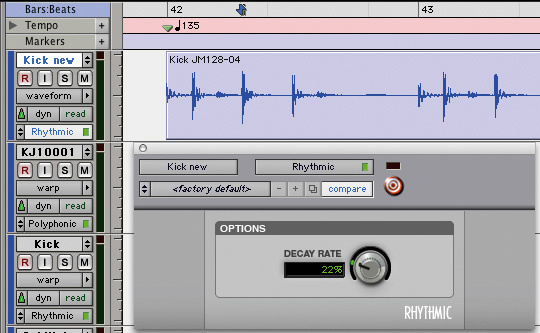 When you're happy with the way the track is sliced up, you can have it automatically conformed to Session tempo or a groove (see below), or switch it to Warp View if you want to edit its timing manually. Switching to Warp Mode allows you to place Warp Markers. 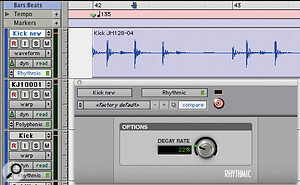 This example shows what Digidesign call a 'range warp', where audio between two fixed points is stretched by clicking and dragging with the Grabber tool. In Warp View you can see three types of Markers: the Event Markers created by the analysis, Warp Markers and 'Tempo Event Warp' Markers. The last are not editable, and only appear on tickbased tracks, indicating where Elastic Audio has been used automatically to conform the audio to events on the Tempo Track. If no quantising has taken place (see below), there will initially be no Warp Markers in Warp View, but the Event Markers will be there. If you click to grab one of these and move it around, you will stretch the whole Region, with the start remaining fixed (unless you Alt/Optionclick, in which case the end stays fixed). Add a single Warp Marker somewhere in the Region before using the Grabber tool to drag an Event Marker, and the results are similar, except that the Warp Marker rather than the start or end of the Region is treated as the fixed point. If you have two Warp Markers in your Region, clicking and grabbing affects only the audio between these markers; alternatively, you can make a selection that encompasses a number of Warp Markers, in which case the two outermost ones within the selection will be the fixed points. If you move a Warp Marker so far that the amount of time compression and expansion is deemed to be excessive, Pro Tools warns you by turning that section red. 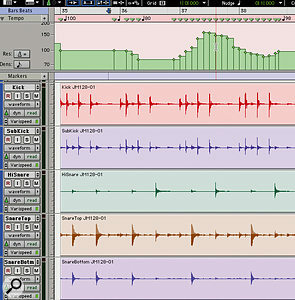 The screenshot below shows a realworld example where I used Elastic Audio to bring vocals into time. The sync mark (with the green arrow) shows where the singer placed a syllable change, while the yellow line in the track above is the locator point, which shows where the instruments changed their chord. The two should be in the same place, but aren't. So I switched the vocal track to Elastic Audio, went into Warp view, placed Warp Markers at the start and end of the word to act as anchors, and then placed another at the syllable change point. Then I simply dragged that point to the right to line up with to the locator point, and the singer was in time with the instruments — simple. All of this was in a Session with no click and no tempo grid to work to, and all tracks were samplebased rather than tickbased. The Elastic Audio plugin window enables you to finetune the timestretching.If you need to change the tempo significantly — especially if a significant slowing down is involved — you may find the sound has been compromised, but Elastic Audio has another feature to help counteract this. Clicking on the Elastic Audio Mode button opens up the Elastic Audio plugin window for that track, and you can adjust the Decay control to bring the sound quality back into line. Sometimes you can also improve the results by switching to a different algorithm: for instance, if you are stretching kick-drum sounds to get a longer, richer thud, it is worth trying Polyphonic mode rather than the usual Rhythmic, and increasing the Decay value. Here, Warp Markers are being used to move a syllable change within a word so that it coincides with a musical event.Prior to Elastic Audio, producing believable varispeed effects has been difficult. It could be done by adjusting the clock speed of Pro Tools and somehow recording the result; then came along a couple of Audiosuite plugins, including Wave Mechanics Speed, Waves Soundshifter and Serato's Pitch n' Time, which could render good varispeed effects, but none was especially cheap. Now, however, Pro Tools can do it out of the box: simply make sure your tracks are set to use the Varispeed algorithm and draw your slowdowns and speedups on the Tempo track. You can use Elastic Audio on samplebased tracks, but if you want to automatically conform a Region to the Session tempo, you'll need to switch your track to the tickbased timebase. You can then rightclick the Region and select Conform to Tempo, and Pro Tools instantly moves all the events so they line up with the tempo of the track. It seems so much more 'intelligent' than Beat Detective, which may well be down to the improved transient detection. You can also quantise audio to a groove, rather than the strict tempo of the Session. This is accessed from the Event Operations option in the Events menu; if you choose the Quantise option in the submenu, you can select a groove from the dropdown menu. Make sure you have Elastic Audio Events selected at the top — if you have Audio Regions selected, Pro Tools will move the complete Region rather than the elements within it. At last it's possible to create realistic tapestyle varispeed in Pro Tools, by switching tracks to Varispeed mode and editing the tempo map.Does Elastic Audio replace Beat Detective, then? In many ways I think it probably does, although Digidesign have added an improved analysis option to Beat Detective, which suggests they think there is life in it yet. The key difference is that Beat Detective 'cuts up' files and moves small regions around to conform events, whereas Elastic Audio uses time compression and expansion. I had expected that Beat Detective would be the only way to be sure you could guarantee absolute phase coherence when moving around groups of events across multiple tracks. However, I understand that one of the reasons why version 7.4 took longer to release than Digidesign had hoped was that they wanted to be sure that if you used Elastic Audio across multiple tracks within an edit group, it would all remain phasecoherent. Certainly, judging from the content I have played with personally and heard in demonstration, Elastic Audio is more than good enough at reconforming multitrack events without creating undesirable sideeffects. I am sure I will not be the first to be saying "I wish I'd had Elastic Audio for the last job I did. It took me ages to sort out and with Elastic Audio it would have been done in no time at all!" Various other aspects of Pro Tools have been improved to make integration of Elastic Audio as smooth as possible. Many of these enhancements are found in the Digibase Browser. At last, there is a volume control so you can turn down the volume when auditioning samples in the browsers. I, along with many others, am fed up of being blasted when auditioning loud samples and files, so this is very welcome. A new Conform to Tempo option means that files being auditioned in the Browser will be analysed and then will play at Session tempo rather than their native tempo. You can also audition loops while the Session is playing, in which case Pro Tools will wait for the downbeat and play the samples in sync with the Session. The volume control enables you to 'mix' in the sample and hear it in context with the rest of the session. You can now rightclick files and folders in the Digibase Browser and analyse them in advance, to save you time when looking for files for sessions. Analysed files have a big tick against them and display a duration in bars and beats. They can be dragged straight into your Session Edit Window, whereupon Pro Tools will create new tracks with Elastic Audio already turned on and the files conformed to the Session tempo. When you select one of a pair of Split Stereo files or a group of multichannel files, the entire file now previews together unless you press the Shift key when you start previewing. Another area of the program that has changed in v7.4 is the Playback Engine, and some of these changes are reflected in the Playback Engine window. The DAE Playback Buffer size is now displayed in milliseconds as well as the usual 'levels', and there is now a Cache Size dropdown menu for determining the amount of memory DAE allocates to prebuffer audio for playback and looping when using Elastic Audio. If Digi's Structure sampler is installed, the Playback Engine window now allows you to set a Plugin Streaming Buffer Size to determine the amount of memory DAE allocates for sample playback, and has an option to 'Optimise for Streaming Content', for improved playback of sampler plugin samples from your audio drives. REX file handling has been improved, and you can now import REX files as Region Groups. It is now possible to change the waveform vertical zoom level on individual tracks by Ctrl (Windows: Start)dragging up or down with the Zoom tool. If you zoom an individual audio track, or group of tracks, the waveform display on that track remains offset when you zoom all tracks, unless you reset the waveform height. If there are no tracks in the Session, and you import a tickbased audio file, Pro Tools will give you the option of importing the tempo from the file. In Pro Tools HD 7.4, stereo surround panners are now linked by default, so when you create a stereo track that is routed to a multichannel output, the left and right pan controls are linked, as well as the Front Inverse, which inverts Left and Right pan control linkage across front and the Rear Inverse, which inverts Left and Right pan control linkage across rear. The Front/Rear Inverse pan control remains unlinked by default. When you open a Session with missing files, the Missing Files dialogue now includes the option to Regenerate Missing Rendered Files Without Searching. This is great when you know that the missing files are only fades and so on that can easily be regenerated. Pro Tools now supports receiving MIDI over Rewire, allowing you to route the MIDI output from a client application such as Reason to the input of a Pro Tools MIDI or Instrument track. This is especially useful for recording changes to parameters in a Rewire client application onto a Pro Tools MIDI track. Pro Tools 7.4 LE now has on/off footswitch support for 003, 003 Rack, 002, 002 Rack and M Box 2 Pro interfaces, and the ability to punch in and out with a footswitch has been added to the M Box 2 Pro. 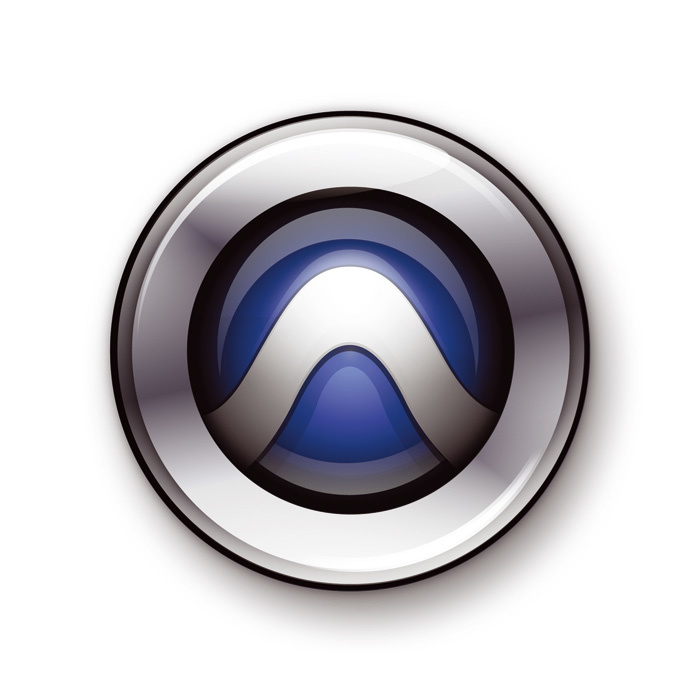 There have been a significant number of Avid videorelated improvements in all the versions of Pro Tools 7.4. Pro Tools systems with Avid Mojo now have access to all the video resolutions previously supported by Pro Tools with Avid Mojo SDI or AVoption V10. Support has been added to enable the coinstallation of Avid Xpress Pro 57.x with all versions of Pro Tools 7.4 on the same computer. Digidesign have added a number of previously HDonly features to the LE version when used in conjunction with Avid Mojo SDI hardware and 003 or M Box 2 interfaces. For HD users, Avid Media Station PT 2.7 Software with the Video Satellite Option eliminates timeconsuming video exports and removes all videoprocessing burdens from the Pro Tools system by synchronising playback with Media Station PT on a separate, dedicated computer. Elastic Audio is a lifesaver and very neatly integrated into the program. At last, a volume control in the Digibase Browser! The technology behind Elastic Audio is familiar, but the way Digidesign have incorporated it into Pro Tools makes it something special. Upgrade from v7.3 #52.88 (HD) or #29.38 (LE/MPowered); upgrade from earlier versions #129.25 (HD) or #47 (LE/MPowered). Prices include VAT.